One of the most highly anticipated editions of the eleventh signature shoe of LeBron James is now available on the sneaker market. 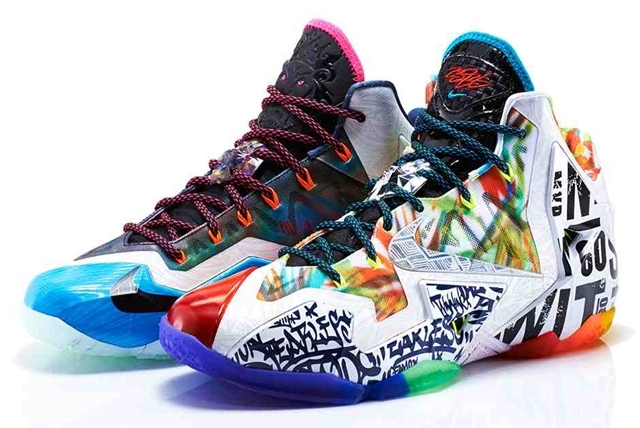 The new LeBron 11 “What The” can now be yours for just $250 per pair. This impressive-looking sneaker features a multi-colored upper part with a unique design that is said to be inspired by eight elements of previous LeBron sneakers along with 20 graphic from previous sig sneaker of the Cleveland Cavaliers superstar. This edition, which is listed as the Black Lava/Silver Ice-Galaxy Blue colorway, is a limited release so make sure to get your own pair immediately.